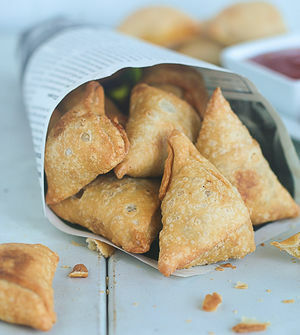 Samosa Sales are a unique way of fundraising on McGill Campus. Different clubs and organizations book tables around different departmental and non-departmental controlled buildings to be able to sell the samosas they order to raise funds for their causes. The EUS has tables available for booking in McConnell Engineering Building officially and non-officially in Trottier. Thou shalt eat no other fried lunch-foods other than Mose. Thou shalt not post any graven images other than Mose sales or Searchers. Thou shalt not take the name of Mose in vain. Remember thou the price of $1 for 1 and $2 for 3 and keep it HOLY. For the hunger of thy brethren is ever greater than their purses, and ye who dishonour this truth shall be cast out. Honour thy Searchers, that thy hunger for Mose be satisfied evermore. Thou shalt not omit location. Thou shalt not join other Mose Groups, lest thou be accused of heresy. Thou shalt not sell cold Mose. Thou shalt not post false Mose Sales. Thou shalt not covet thy neighbour's Mose, thy neighbour's chutney, thy neighbour's napkin, nor thy neighbour's plate, nor any Mose paraphernalia that is thy neighbour's. This page was last edited on 4 April 2018, at 06:15.